Members of the Business Professionals of America at Madison College pose with their awards at Lakeshore Technical College. Students from the Business Professionals of America (BPA) chapter at Madison College attended the organization’s 2016 State Leadership Conference at Lakeshore Technical College in Sheboygan on Feb. 18. 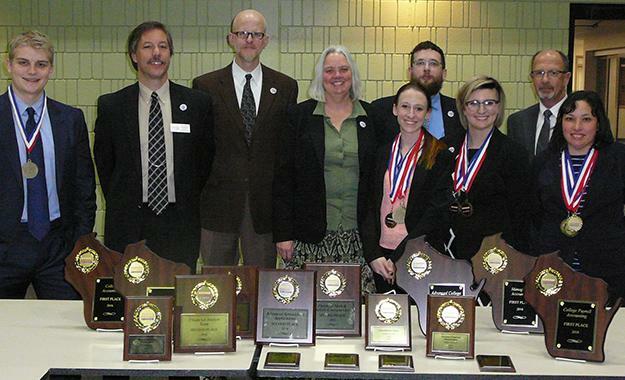 The conference is a qualifying event in which students in the Wisconsin Technical College System participate in a collection of professional skills competitions. Students who compete have the opportunity to qualify to compete in a national competition to be held in Boston on May 5-9. Madison College produced national qualifiers in 22 events, including five first-place finishes and five second-place finishes. Not every qualifier will be able to compete at the national competition since colleges are limited on how many events they can participate in at nationals, and Madison College had too many qualifiers. Theresa Bradley – first place in advanced college accounting, first place in managerial accounting, member of the second place financial analysis team. Kimberly Chan – fifth place in advanced college accounting, fifth place in managerial accounting, member of the second place financial analysis team. Paul Crump – first place in banking and finance, first place in college accounting, member of the second place financial analysis team. Matthew Hults – second place in prepared speech, third place in human resource management. Emily Kornetzke – first place in college payroll accounting, second place in interview skills, third place in personal financial management, fifth place in fundamental spreadsheet application. David Sanders – second place in advance spreadsheet application, third place in contemporary issues, member of the second place financial analysis team. Danielle Valentino – fourth place banking and finance, fourth place college accounting, fourth place federal income tax accounting, fourth place personal finance management. The students were joined by instructors Dan O’Brien and Mark Quinlan and Senior Vice President of Student Development Dr. Keith Cornille.